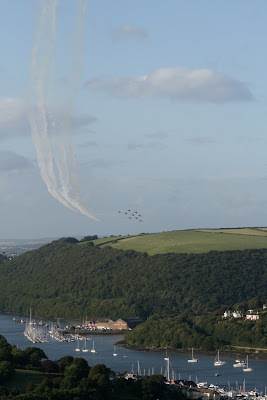 Dartmouth Regatta is one of those not to be missed events, especially watching the Red Arrows as they duck and dive along the river valley.. it's absolutely stunning. I personally think this is the best place to see the Arrows display.. I have seen them perform in many different places, even witnessing some dramatic events - many years ago I was up on a hill over looking Sidmouth, watching the display, when, all of a sudden one of the planes dropped out of the sky, the pilot ejecting out just in time to see his beloved plane dive into the sea... another plane left a smoke cross over the spot where the pilot ditched into the sea and many little boats that had been bobbing about in the sea rushed over to help him out... It was even better than the display itself!! 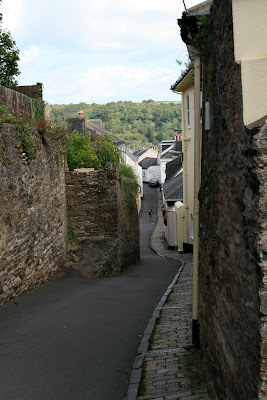 Anyway, it was on a sunny afternoon that we decided to brave the traffic and head into Dartmouth.. the only parking was at the top of town.. up a long, long steep hill. I only managed to take photos on the way down.. much panting and complaining on the way up!!! 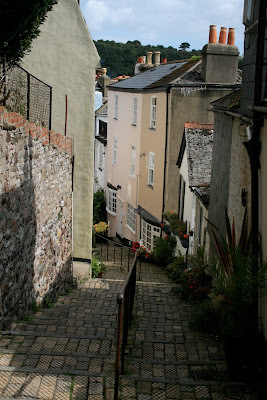 This has to be one of the narrowest streets.. and yes, cars do drive up and down it... carefully!! A great view over the rooftops towards the river mouth.. 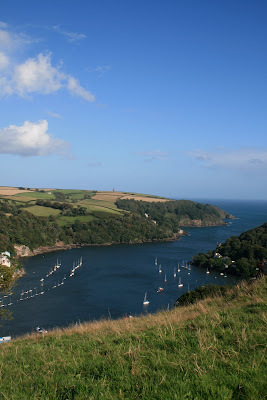 It was then up to the top of town and a short drive to Jaw Bones Hill where you get the best view point in the whole of Dartmouth to watch the air displays.. also the windiest.... brrrr! 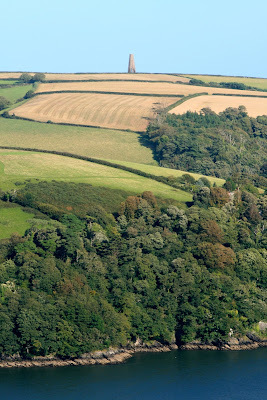 A view across the river towards Kingswear, the steam railway and a helicopter display.. don't ask me what kind of helicopter.. I have no idea!!.. 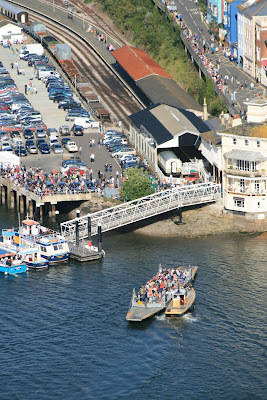 This is the steam railway station and in the river you can see the Lower ferry.. no cars allowed during the Regatta, so it's full of pedestrian passengers. Looking across the river towards the Day Mark.. this is one of my favourite places to walk.. I'll take you there sometime. How lovely to live here... can you imagine it? 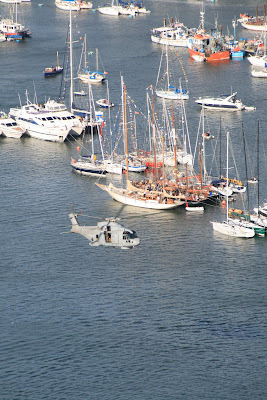 Sleeping to the sound of the water.. little boat to mooch up and down the river.. idyllic..
Another amazing display from another helicopter... don't know what this is either, however it was FAB! And this is what we all love to see... lots of ooooh's and ahhhh's!! The planes approach each other along the river valley, its stunning!! They never disappoint do they? Such dedication to their career, such perfection and immaculate timing... what an inspiration. And I just love that ROAR that makes your insides shake.. so exciting. Where was you standing to see those amazing views? 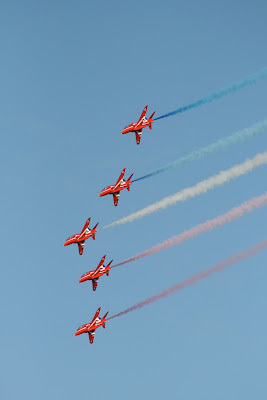 I remember the pilot ditching in the sea at Sidmouth we use to live in Sidmouth and watched the Red Arrows from our garden. 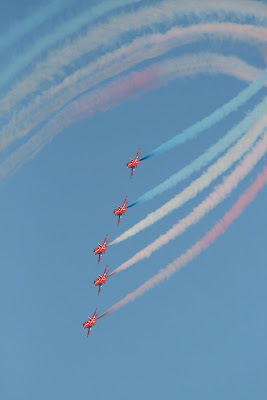 We have also seen them from the Naval College grounds a few times as dad worked there for many years. 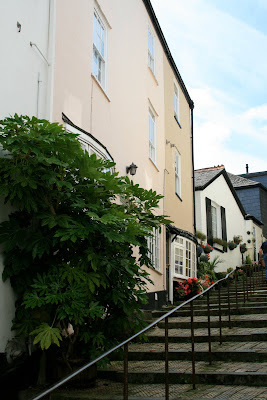 I am so glad that you blogged this as dear MR S refused to take me! He said it would be bedlum in and around Dartmouth! Fabulous post, I love the photos! 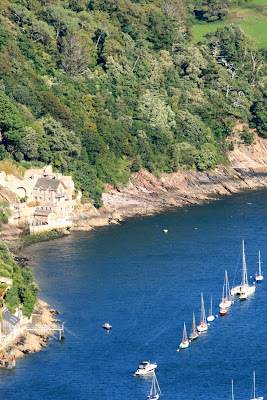 I have recently returned from a holiday in the Dartmouth area and it's lovely to be taken back to it via your post. 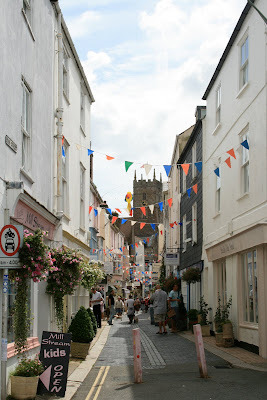 I really wanted to go to the regatta but will try next year. I am about to catch up with your past entries.